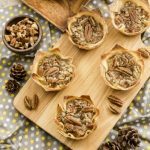 Weight Watchers Mini Pecan Pies allow us to have a delicious dessert without all the guilt at those holiday meals. Whisk together 2 eggs, Pyure, maple syrup and vanilla extract for 2 minutes or until the Pyure is dissolved in the liquid. Add the finely chopped pecans and mix well. Spray a 12 cup muffin pan with nonstick cooking spray. Place 2 wonton wrappers in each cup at an angle. Add a tablespoon of the pecan filling into each cup. Top with a large piece of pecan in each cup if desired. Bake at 350 F for 12 to 15 minute, or till the wontons cups are golden and the filling is set. One mini pecan pie is 3 Freestyle SmartPoints. If you leave OFF the pecan half on each pie cup it will be 2 Freestyle SmartPoints per pie.